Is the Assembly of First Nations still relevant? The very existence of the Assembly of First Nations was supposed to be on the line in December 2014 when chiefs gathered in Winnipeg to elect Perry Bellegarde of Saskatchewan as their new national chief. The issues were so big and varied, it appeared that nothing short of a miracle was going to keep the organization alive. The AFN is the national lobby group for 639 often divergent nations spread out from coast to coast to coast. Developing a collective, national voice at this time or any time has arguably been the most difficult job in politics -- aboriginal or otherwise. Throw in four crises cascading together, any one of them with the potential to scuttle the organization, and you remove any argument. First of all, drastic funding cuts by the Harper government have curtailed the ability of the AFN to perform its primary functions: policy analysis and legal work to protect the rights of First Nations people (and pay the rent). Two, there were questions being asked about whether or not the organization is relevant anymore. Was it out of touch with the rank and file? Grassroots people claim they have no access or input to the AFN and many wonder what the organization even does (especially for them). The third problem concerns the very structure of the AFN. Critics say First Nations should be organized around treaties instead of through Aboriginal Affairs and Northern Development Canada under the Indian Act (that would require a major overhaul). And four, Chiefs were still seriously upset because previous national chief Sean Atleo veered off on his own agenda instead of following the direction set by the chiefs. Recall last January when Atleo met with Prime Minister Stephen Harper after many chiefs told him not to and then supported a new education act that most Chiefs vehemently opposed. Bellegarde, a lifelong politician from Little Black River First Nation, needs all of the experience and expertise he has gained from a career at local, provincial and national levels to juggle so many crisis points. But just two months in, he seems to have things back under control. As for making the AFN more inclusive, Bellegarde welcomes the input of grassroots citizens and organizations like Idle No More. "The Corbier decision gave every First Nations person, both on and off reserve, the right to vote for chief and council. Their views are at the top of the pile which filters down through tribal councils and provincial organizations to the AFN," Bellegarde said. Bellegarde is also open to re-organizing or restructuring First Nations along treaty territories rather than provincial boundaries. "If the people would rather be grouped as treaty one chiefs or unite as Cree or Ojibway, that is fine as long as we maintain a strong, united, national collective voice. We must be respectful of the diversity so that we can be relevant and responsive to the needs and issues identified by our people. We are developing more outreach programs to hear the opinions and recommendations of our grassroots, with structures to include the wisdom of our elders, our women and our youth. By using more social media, like webinars, Facebook and Twitter and our website, we can get the feedback we need to carry their views forward." - Perry Bellegarde​. Meaningful consultation is obviously very important to the new national chief and that is what he also expects from the federal government; something which Bellegarde says has been lacking in the past. 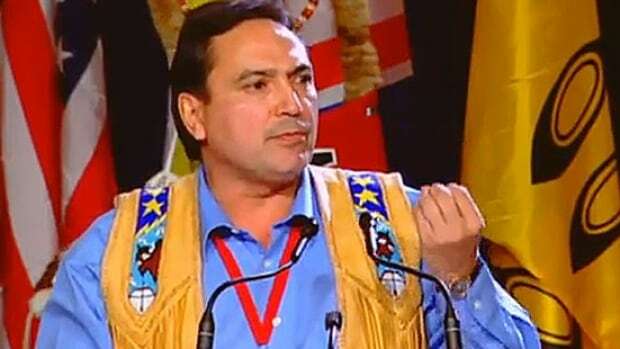 "There was no meaningful consultation during the development of the First Nations Control of Education Act and it ended up a misnomer because not only was there no meaningful consultation, First Nations do not have control over education through this legislation," Bellegarde said. Bellegarde says the chiefs also oppose Bill C-438 to amend the Indian Act, which has been out forward as a private member's bill by M.P. Ron Clarke from Saskatchewan. The position of national chief is a balancing act that requires listening more than leading because the job is to represent the position of the chiefs on issues rather than dictate or decide what needs to be done. While mainstream politicians may be elected to study and exercise their judgment on a number of policies and programs, the national chief is bound by the decisions made by the chiefs. Whenever new national Chief Perry Bellegarde states a position on an issue, he is representing what the chiefs want, not what he wants. His influence stems from the legal work and policy analysis his office provides to the chiefs. There are various forms that bring the chiefs together to make decisions and then it is up to Bellegarde to help the chiefs make their views known to the powers-that-be. It's the complete opposite of the mainstream political system in Canada. With the voters on top of the pile and directing policy through local, provincial and regional groups down to the national level, it is something that would certainly make those who favour referendums happy. Bellegarde's approach is in keeping with the way the AFN was set up - to be a strong, united, national voice representing the interests of First Nations from coast to coast to coast. Don Marks is the editor of Grassroots News.